This is race #2 in the Aravaipa Drt Series. 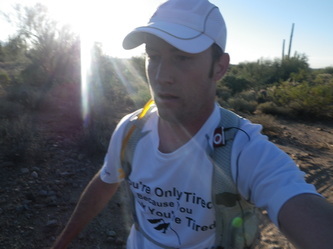 With the Fat Ox 50 Miler the following weekend I'm leaning towards maybe just the 10 miler or even the 26k. 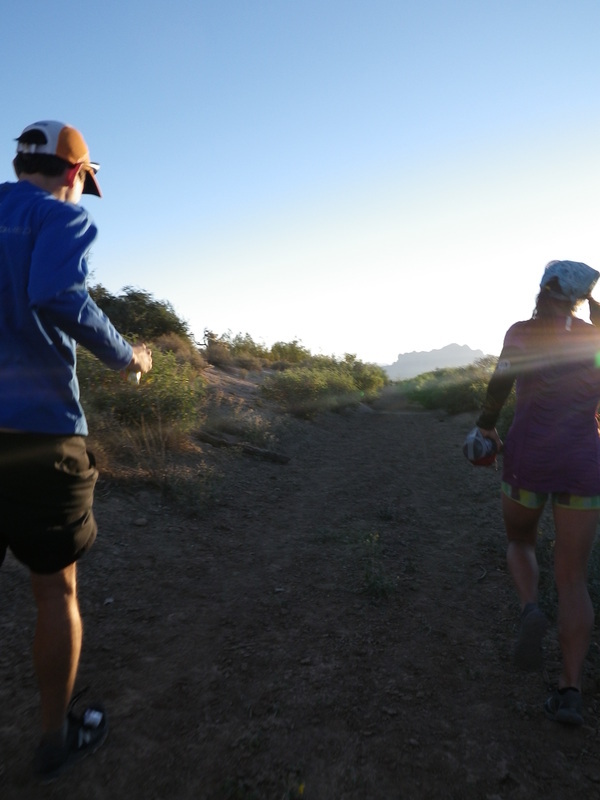 I've heard the trail is a lot of fun out there and it would be great to get to run some new trails. I wasn't feeling great from the start. Only 12 of us were signed up for the 50K distance so the other 50+ people were signed up for the 9K, 10M, or 26K distance. 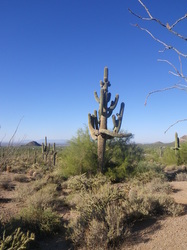 I started out running with regular ultra runners Paulette, Jon R., and Kat clipping along through the winding desert trails between teddy bear cholla and gigantic, old, mature Saguaro cactus. 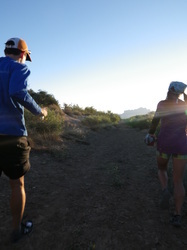 Paulette led us through at a consistent pace that was comfortable to talk and it made the miles pass freely as the sun came up over the Superstition Mountains. By the first aid station and mile 8 we had already lost Paulette who was taking off to make the climb up Pass Mountain. 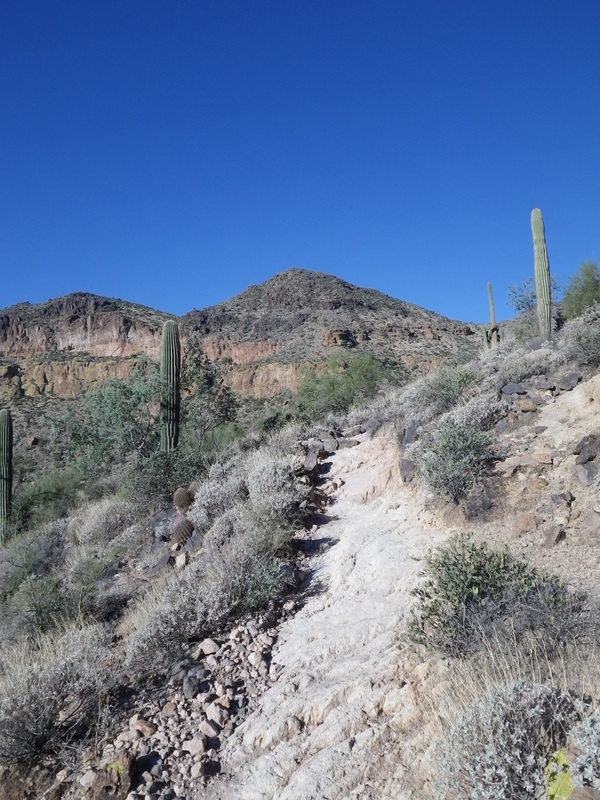 The climb was moderate and more of a long steady climb up the sandstone cliff and along the ledge. Only about 800 feet in total climbing it made it's way to the north side of Pass Mountain where the Superstition Mountains opened up to the North East and some amazingly beautful singletrack overlooking pristine Sonoran Desert. Jon, Kat and I were all still hanging along together as we sped down the winding trail that would lead us to the completion of our first "lap" of the 50K course. Jon pushed ahead trying to make up time and to catch his long time nemisis in local races, Paulette. Still within sight he took off and Kat and I hung back a hundred yards or so. My lungs still not quite opened up and allowing me to break out of this sluggish feeling I was happy to keep back a bit with Kat. Kat was only 3 weeks removed from a stellar 20 hour Javalina Jundred and I think at this point she was feeling a little beat up. At about 13 miles she turned off to the rest room area and I wouldn't see her again. I saw a few ribbons ahead and sped off down the trail, my latest gel kicking in, music roaring and the trail laid out plainly in front of me. I felt great clipping along at an 8 min mile through these giant Saguaro's and it was about then that my race went downhill fast into a very dark place. Intersection number one. 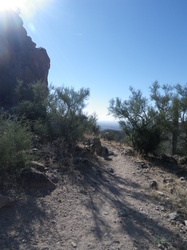 The sign says "Aravaipa Trail Runners" with an arrow to the right. The ribbons continue to the left. Iknow the course loops left. I hestitate and go left asking the next three runners if they saw a Paulette and Jon in front of me. The second guy says yes and I continue along in hesitation. I reach the intersection sign for the other distance turnoffs and continue on to the aid station at the base of the Pass Mountain. My left toe nail feels like it is coming off with every step which brought me to a near crawl a hundred yards before the aid station. My stomach went south a while ago and music has lost all it's glory. All within the last 10 minutes. I don't see Paulette, or Jon or Kat behind me. I only see the 26K runners now which only worries me because while I'm 15 miles into the race in 2:25 I doubt that is quite fast enough for first place. I patch up my toenail and blister and head out and up the Pass. The entire way I look back over and over...hestitating to even continue on thinking I very well may be off course and disqualified. I'm too far along and just keep plodding along. Every step feels like I'm tearing my toenail off so at this point I'm more concerned with jeapordizing my Fat Ox 50 miler the following Saturday if I injure my foot here. As it was I am halfway up Pass Mountain so I didn't really have a choice. I head up the mountain running most stretches only occassionally walking. This allowed me to pass a good deal more of the 26K runners which always feels good. They were on their first lap and were walking the hills while I was on my second lap and running them. Of any area in my running over the last 11 months that has really improved its the uphill running. I usually feel really strong headed up the hills and can run infinately more hills now than when I first started. Not nearly as fast as a lot of people but for me it's made a big difference. "Yeah, I'm a moron. I figured I was disqualified a while back when I stopped seeing 50K bibs and my GPS mileage wasn't lining up correctly." "Well, if you've already done the Pass twice you only have this one section left so if you want to finish you can do that portion and circle back through here afterwards." Serious hesitation...I'd already completed 22+ miles, 4 hours of running and I had a wedding to get to. I had a 50 miler the following weekend as well that I should rest up for. My mind was not in completing this race, my body felt completely disinterested in it. All things pointed to dropping and heading home to get ready to head to the wedding. "Great, see you guys in a few hours." I yell out over my shoulder as I jog off down the trail to repeat the missing section of my race. Loop courses have their flaws and the biggest flaw is mentally running a section of the course you have already done but later on in the race. Four hours ago when this race started I was fresh, spry and having a great time clipping along 8 minute miles with a group of people not even paying attention to the trail, just having fun. Second time around, 22 miles later? I hated this trail. I was in a dark place. The trail was flat minus a few minor ups and downs. 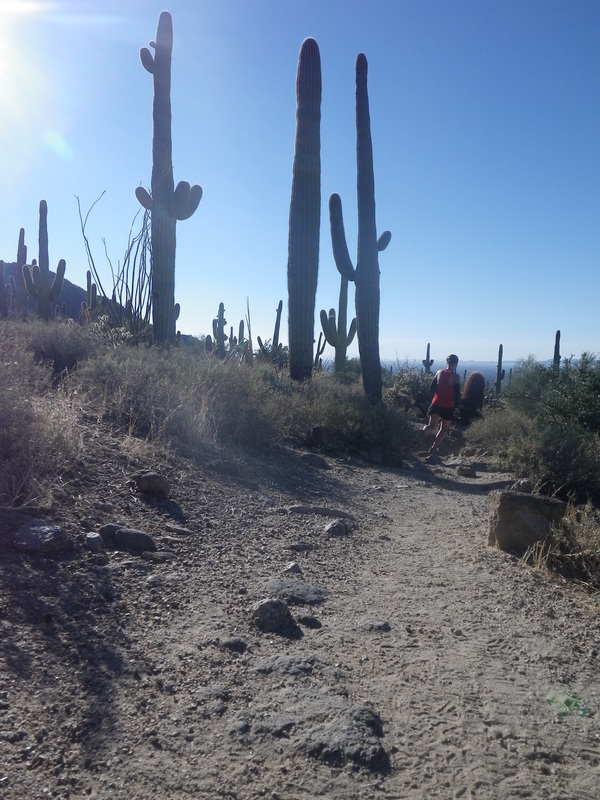 Just wandering aimlessly through giant saguaro and forests of teddy bear cholla. The weather was absolutely perfect. Sunny, but not hot. Clear, blue, perfect Arizona skys. I didn't care. I was miserable. I knew where the trail would end up at the base of Pass Mountain. 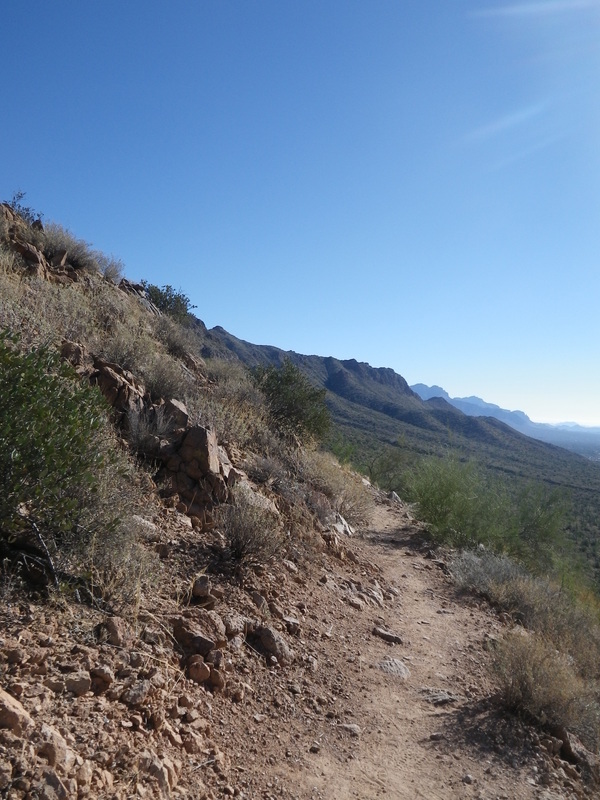 I could see the spot across the horizon yet the trail would take me the opposite direction. I didn't want to run but wanted to get this over with. I couldn't get myself to break a 10 minute mile no matter how hard I tried. I wasn't even feeling that tired physically. I just felt drained with energy. My legs usually feel amazing at 20 miles or so (relatively speaking) and I have in the past pushed out some really strong miles. I was eating a good amount, drinking a lot of water, staying up on my electrolytes and salt. I don't know what the issue was but I didn't want to run. But I did anyway. I watched that point on the mountain as I zig zagged my way through the desert, ever so slowly cutting down the miles until the turn off. I stopped to walk twice in sheer anger and couldn't stop staring at my watch which only made it that much worse. Finally, just when I was about to write off ultrarunning, cancel the Fat Ox, and find a new sport I came upon a Tonto National Forest trail sign. Ten feet further was the turnoff. Elated would be an understatement. I knew from that turnoff was about a half mile to the aid station again and then only 1.5 miles to the finish. Home. In any race the thought of crossing the finish line to cheers and a chair is enough to send me straight to a runner's high and some fast, quick and stubborn miles leading to the end. My legs loosen up and I picked up the pace a lot coming into the aid station. I come out of the wash to find Nathan Coury standing there smiling. We laugh off my getting "lost" for a minute while I throw down some Mountain Dew and gatorade and I head off for the last mile and a half. I made it the next 1/2 mile doing faster miles knowing the finish was close by but it didn't take long before my right groin muscle just started locking up in a bad cramp. Perfect. Only a mile left and I'm forced to speed walk up the hill to the finish. A few hundred yards of recovery walking and I start the slight climb to the pavement. Once I hit the pavement I knew I was done and I start to open up the stride. The final 300 meters of an ultra are my favorite bar none. This is where i know I've just compeleted something difficult and I don't have to conserve a drop more of my energy and after all those miles I can finally sprint hard without recourse. Every race, and I mean every, I have sprinted as fast as I could possibly go the last stretch of the race. I love the feeling of going out 100% full to the max, legs gorged, knees high, arms pumping hard and head back in the wind. Then the sounds of people cheering as you fly through the finish instead of stumble and the look on their faces. People always beat me in these races, people are always going to be faster, stronger, quicker. Yet I always will have the finish because nobody will ever push it harder the last few hundred yards. Coming into the finish I flew on in feeling my tight groin starting to tweak and lock up. I was rounding the last corner and pushed hard to come on in as the meager following of bystanders gave their congratulations. Winded and ever grateful for just being finished I dropped my gear and began the obligatory "what happend to you?!" and "How'd you get lost!?!"